According to the ISIS database of Zoo animal collections, there are only two zoos in the United States with exmoor pony displays. These two zoos are our very own Santa Ana Zoo and the Buttonwood Park Zoo in Massachusetts. Both animals on display are geldings, and there is no chance of breeding these two males. The small, sturdy breed has ample bone, and can carry heavy burdens in relation to its build. It is very sure-footed, and has strong legs and feet with a smooth stride. The head is large, with small ears. The ponies' eyes are surrounded by a ring of light colored hair, and have a toad-eye appearance due to the fleshy rims that are used to divert water. The exmoor pony is listed as endangered by the Rare Breeds Survival Trust, and is the oldest and purest of all the British native ponies. 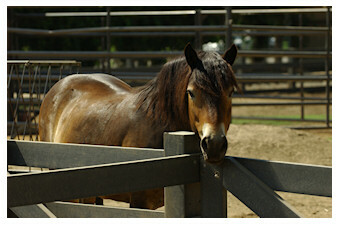 Come visit Danny, our exmoor pony, in the Crean Family Farm. There are so many things in life that we take for granted every day. We have access to so many things so easily here in the USA- anesthetics, medications, medical supplies, laboratory testing, and experts in every field. Costa Rica is very advanced in many areas, but is still so far behind us when it comes to wildlife care. Only the National Zoo has a gas anesthetic machine, which is a bumpy two and a half hour drive away. The anesthetics we use everyday to anesthetize and reverse animals are not available. Commonly used medications are expensive or not routinely available. 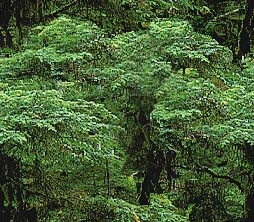 Costa Rica is very proud of their rich ecology, basing much of their national income on eco-tourism. While it is only 0.1% of the world's landmass, it holds 5% of the biodiversity. They are very protective of their wildlife, making it illegal to own any of their native wildlife, including macaws, parrots, ocelots, and capuchins. This results in a double-edged sword. Some citizens are overly concerned and take animals they believed are orphaned (when this is rarely the case) to rescue centers and some citizens continue to poach animals and try to keep them as pets. These animals then are confiscated and are turned over to rescue centers. 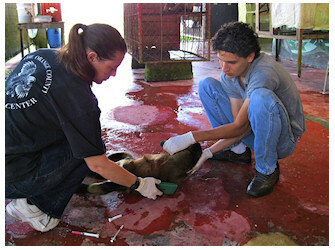 La Marina Wildlife Rescue Center is in the heart of Costa Rica. It is not in a major tourist area, which is difficult for a facility that relies heavily on donations and public visits. They have a number of permanent animals, including scarlet macaws, Amazon parrots, spectacled caimans, tapirs, spider monkeys, capuchins, white throat and collared peccaries, jaguars, ocelots, margays, jaguarundis, African lions, various snakes and raptors- just to name a few. The rescue center was unofficially started 2 generations ago by the grandparents of the owner, Juan Jose Rojas, affectionately known as Juanjo. They are dairy farmers, which is what supports most of their rescue efforts. People began bringing injured and orphaned animals to the grandparents, knowing their compassion for animals. Their work blossomed into a full center, which now not only takes in injured animals from local citizens, but also works with the national wildlife agencies to care for confiscated and injured animals. They have successfully been able to return many of these animals back to their natural homes. We helped the center to do exams, TB test, and bloodwork on three spider monkeys they are preparing to release. We also did exams and microchipped a number of their other animals, including another spider monkey, tapirs, capybara, margay, lions, parrots, aracari, and scarlet macaws. We were able to do all of our exams and microchipping due to the generous donation of our anesthetic drugs, microchip reader, and box of microchips to La Marina Wildlife Rescue Center from the Santa Ana Zoo Conservation Fund. La Marina Wildlife Rescue Center has become involved with the IUCN/SCC Tapir Specialist Group and is very successful in breeding tapirs. They exported a tapir to the Nashville Zoo in 2008- a major accomplishment since anything exported from Costa Rica must be third generation captive born. Now, they are trying to breed jaguars, which are endangered in Costa Rica. Currently, no one else is attempting to breed jaguars. 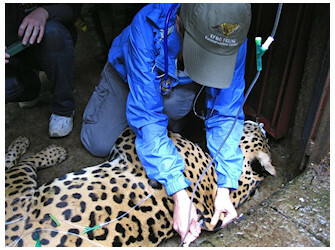 We were able to anesthetize, examine, take a blood sample, and microchip the male jaguar. They had just bred, so we did not want to risk anesthetizing the female in case she had conceived. They did not have ultrasound or the ability to measure hormone levels, so the risk to the potential baby versus how much we would learn was too high. Everything went so smoothly with the male, the local veterinarian, biologist, and the Costa Rican head of wildlife and CITES (Convention on International Trade in Endangered Species) were all impressed. We left La Marina Wildlife Center with their shelves stocked with medical supplies, anesthetics, medicine, and hope. They have asked us to return when their female jaguar is ready to give birth to assist if there are any complications. We are also working with them and a neighboring facility to make regular visits to assist with routine care and breeding of their felids. We plan to help both facilities design basic clinic areas for treatments and surgery. This trip was a wonderful experience. It reminded me of how good I have it as a veterinarian here in California. I met many wonderful people who really have a passion to help the animals and do what is best for them. They want the help and are willing to make the changes necessary to improve the quality of life and breeding potential for all of the animals in their care. I am looking forward to a long relationship with La Marina Wildlife Foundation.